Would you like to be a volunteer for the Tall Ships Races in Stavanger 2018? We are looking for dedicated volunteers to work both in front and behind the scenes to make The Tall Ships Races Norway’s largest cultural event in 2018. As a volunteer, you will be an important piece of the jigsaw in making Stavanger a great host port, giving the guests in the Vågen harbour area and the visiting crews an experience which they will never forget. You will be part of a team of around 300 committed and enthusiastic people. There will be lots of different tasks to perform, both large and small, all to be carried out with a big smile! Some of the types of tasks you can be given as a volunteer during The Tall Ships Races are listed below, and there are many more. We would love to hear from you! Click this link and join us as a volunteer! In order to coordinate all the amazing 300 volunteers, we need group leaders, volunteer centre assistants and crew to safeguard the easy running of the volunteers’ efforts during The Tall Ships Races. As a liaison, you will be the key point of contact between a visiting ship and the host port. You will have daily contact with the ship and be available throughout the visit. The amount of work will vary from ship to ship. Some of the main duties will be to check whether the ships require supplies from shore, and to show them the way to the crew centre, facilities and other useful places in the city. If you can speak the ship’s native language, that´s a bonus! Language requirements: Norwegian/English and the ship’s language if possible. Age: over 25 years old. A crew friend will assist the liaison and have a special focus on the sail trainees on board. You will remind the crew about excursions, Crew Parade, Crew party and other onshore events and help with registration and info. As a Crew Friend, you will get to know sail trainees from all over the world. Language requirements: Norwegian/English and the ship’s Language if possible. Age: 18-25 years old. There will be several information kiosks in the festival area where we will need talented people who can handle all sorts of queries in a helpful and cheerful manner. 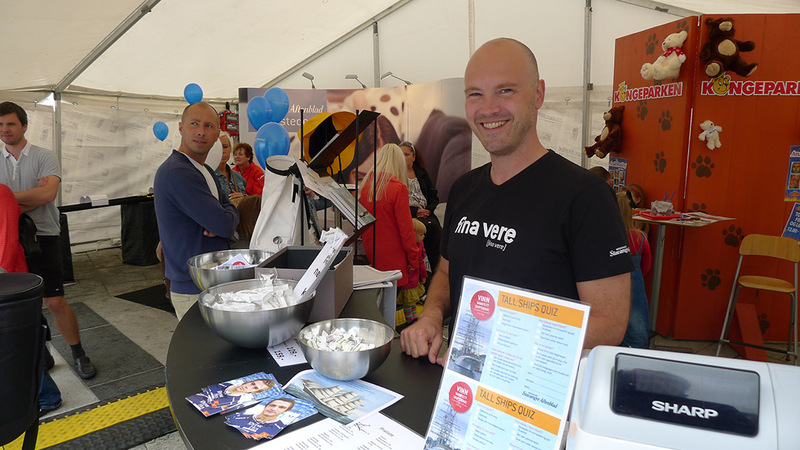 You will assist with programme information, questions about the ships and exhibitors and be the public face of The Tall Ships Races Stavanger. There will be various activities arranged around Vågen open to the public, for both young and old, who will be visiting the festival. We will need help with the organisation and running of these activities. Examples of these could be craft activities in the market square or maritime tasks with the Stavanger Maritime Museum. You can help crews and sail trainees at the Crew Centre where they can relax, and help with info on activities such as trips to Pulpit Rock (Preikestolen), sports competitions and the Crew Party. During an event such as The Tall Ships Races, many things have to be done on an ad hoc basis. Not everything can be planned for and we therefore need flexible people who can lend a hand when needed. There are no specific tasks, but you can expect a fast pace of work with many different assignments. You can, for example, assist with the set-up of smaller rigs for events or in the festival area. Professional suppliers are responsible for all the technical infrastructure. We may need support and technical assistance when required. Nor sure what to choose? Check off against ‘Support’ on the registration form and we’ll find relevant tasks for you!